GENERAL INTRODUCTION TO THE SERIES. DURING the past few years the civiMsed world has begun to realise the advantages accruing to scientific research, with the result that an everincreasing amount of time and thought is being devoted to various branches of science. No study has progressed more rapidly than chemistry. This science may be divided roughly into several branches : namely, Organic, Physical, Inorganic, and Analytical Chemistry. It is impossible to write any single text-book which shall contain within its two covers a thorough treatment of &ny one of these branches, owing to the vast amount of information that has been accumulated. The need is rather for a series of text-books dealing more or less comprehensively with each branch of chemistry. This has already been attempted by enterprising firms, so far as physical and analytical chemistry are concerned; and the present series is designed to meet the needs of inorganic chemists. One great advantage of this procedure lies in the fact that our knowledge of the different sections of science does not progress at the same rate. Consequently, as soon as any particular part advances out of proportion to others, the volume dealing with that section may be easily revised or rewritten as occasion requires. Some method of classifying the elements for treatment in this way is clearly essential, and we have adopted the Periodic Classification with slight alterations, devoting a whole volume to the consideration of the elements in each vertical column, as will be evident from a glance at the scheme in the Frontispiece. 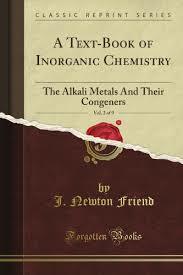 In the first volume, in addition to a detailed account of the elements of Group 0, the general principles of Inorganic Chemistry are discussed. Particular pains have been taken in the selection of material for this volume, and an attempt has been made to present to the reader a clear account of the principles upon which our knowledge of modern Inorganic Chemistry is based. At the outset it may be well to explain that it was not intended to write a complete text-book of Physical Chemistry. Numerous excellent works have already been devoted to this subject, and a volume on such lines would scarcely serve as a suitable introduction to this series. Whilst Physical Chemistry deals with the general principles applied to all branches of theoretical chemistry, our aim has been to emphasise their application to Inorganic Chemistry, with which branch of the subject this series of text-books is exclusively concerned. To this end practically all the illustrations to the laws and principles discussed in Volume I. deal with inorganic substances. Again, there are many subjects, such as the methods employed in the accurate determination of atomic weights, which are not generally regarded as forming part of Physical Chemistry.